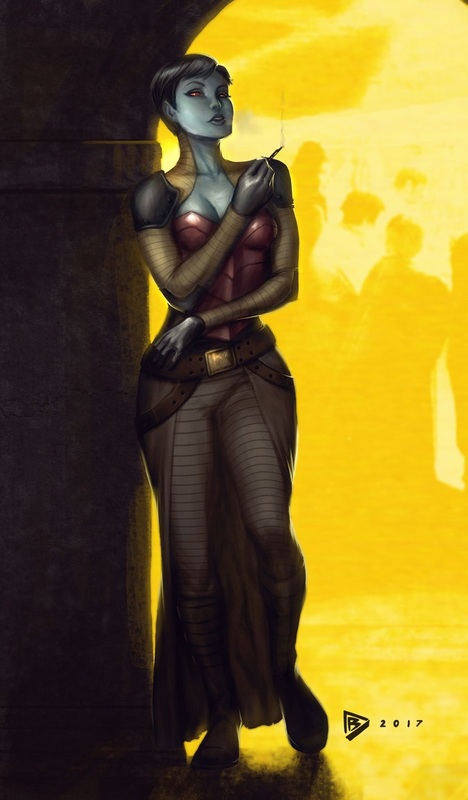 Ishanta is a Chiss female in her mid-thirties. She is slightly taller than the average female with a lithe frame. She walks with a graceful confidence that draws all of the eyes of a room to her. Her cerulean skin, glowing ruby eyes and short black hair come together in a face that is attractive by most galactic standards. Her demeanor is generally positive as she also strives to appear calm and in control of all situations. Ishanta is extremely fashion-conscious and will often wear custom tailored outfits in field work that combine functionality with style. Her overall image is carefully managed so she will avoid overly revealing clothing while conducting operations in order to command respect. Off-duty she can be seen at the most elite nightclubs donning the trendiest outfits from Corellia, Coruscant and other core worlds. Her outfits range from galactic nobility to underworld mistress depending on the venue and her mood. Ishanta is a master of fitting in and impersonation. There is scarcely a planet in the galaxy where she can't manage to find a way to fit in, be it throwing together a convincing imitation of local guard or pretending to be a regular local. Ishanta is so good at such that she may have seemingly lost all sense of personal style and flair, leaving her as always simply the imitator. Despite whatever all her other characteristics may convey, Ishanta retains the air of a person that is confident, if not arrogant. Minor (and often, major) things in her body language - her walk, her stance, her expressions - reveal these feelings. At times, it seems she borders upon narcissism, especially judging from how much she enjoys her own company. Ishanta is extremely cocksure and headstrong. Possessing a keen wit and exceptional level of intelligence, Ishanta will often use her superior intellect to humiliate lesser minds. Basically, she is kind of a jerk, and that can sometimes get Ishanta in a bit of trouble. All who gain power are afraid to lose it, and Ishanta is no exception. Some use their power for good, some for evil; Ishanta, however, knows that these are just points of view. She is on a quest for greater power, and uses all her skills and abilities to ensure her supremacy, regardless of the consequences. Ishanta seems to get her thrills, perhaps sadistic ones at that, from toying with her opponents. Some are content with simply striking down or injuring their opponent, but that is not enough for Ishanta. No, she wishes to see her enemy descend into madness or kneel before her as a blathering mess; or even better, as a fresh new servant with a muddled mind. The Puppeteer usually forsakes outright hurting and maiming her opponent and focuses on illusions, mind tricks, and other wicked means of destroying a person. Ishanta will never go into any situation head-on. Whether it be combat or just strolling down the street, she will stick to the shadows or cloak themselves in the Force. The less they are seen the better. If they cannot sneak up on someone, then Ishanta will not bother confronting them.